Riverside Cottage B&B is situated in the heart of Lynmouth. The bed and breakfast is unique to the area in the fact that six of our rooms have private balconies with amazing panoramic views of Lynmouth, infact, the best view of the river, harbour and out to sea available in Lynmouth. Perfect for relaxing, after a day spent walking or sightseeing around Exmoor and the beautiful North Devon coastline. All seven rooms at Riverside Cottage B&B are en-suite, with tea &coffee making facilities, hair dryer and free WiFi. Well behaved dogs are welcome at just £4 per night. A superb choice of home cooked breakfast, cereals, yoghurt, jams, fruit juices are available every morning. Situated in Lynmouth harbour, the B&B is ideally suited both to the needs of walkers or those who want to relax and enjoy their break. We are on the South-West Coast Path, which is perfect for those who want to explore an abundance of coastal, riverside and woodland scenery, cliffs, secluded bays, Exmoor, with all its many hidden treasures, the Doone Valley, Porlock and Watersmeet. Or, if you choose, a gentle stroll around the village with its enchanting harbour, pebbly beach and beautiful views. There is also Lynton , the little town above Lynmouth connected by a water powered cliff railway which operates daily in season. From Lynmouth or Lynton via the coastal path you can visit the Valley of the Rocks, famous for its herd of wild goats and amazing scenery. 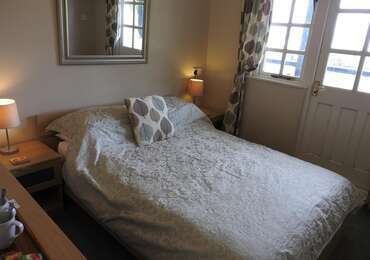 A medium double room with en-suite shower, and private balcony with the best panoramic sea/harbour views in Lynmouth.